A fold up weight bench is a great solution for anyone who enjoys weight training from home but lacks space. Most people would have the available workout space for a weight bench but if the bench was permanently in that spot it probably wouldn’t be ideal as it’ll block walkways or look tacky. Therefore, the ease of being able to fold away the weight bench after will solve that problem. The two best folding weight benches are the Powerline PFID125X and Body Solid GFID225. Both of these can fold flat to be conveniently stored under the bed, against the wall, in the garage or in the shed. In addition, they’re both very durable and offer a long warranty period. 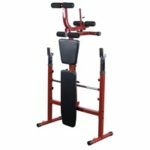 There are also two Olympic folding weight benches which is the Best Fitness BFOB10 and Marcy Folding Olympic Weight Bench, so if you prefer to train using an Olympic bar as opposed to dumbbells and you also lack space then this could be your solution. Unfortunately, these can’t be stored under the bed, it can only fold upright but can still be put aside so it’s not in the way. 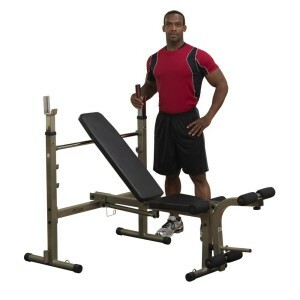 Some people may think a fold up weight bench might not be as strong and sturdy as a good rated adjustable weight bench. Just because the legs fold up so the bench can be stored away that doesn’t make the structure weaker, in fact the two adjustable folding weight benches mentioned above are actually among two of the best workout benches. Even if you had the available space the portable weight benches should be highly considered, as the main purpose of the design was to be strong and sturdy, the folding design just happened to give it a unique edge. In fact, a folding workout bench is one of the best equipment to have for your home gym. 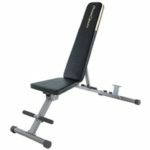 Nonetheless, the need for a compact weight bench is becoming increasingly popular since more apartments than houses are being built. As mentioned, you can store a folding weight bench under your bed which makes them preferable for apartments and small spaces. Unfortunately, you’re more limited when it comes to trying to find a good compact folding weight bench. Fortunately, we’ve compiled together a comparison table showing the top 5 best foldable weight benches. The Powerline PFID125X is still strong and sturdy and can handle a maximum weight capacity of 500 pounds with your body weight included and combine this with the very competitive price makes this our best folding weight bench. On the other hand, if you just wanted something cheap but still portable, then the Fitness Reality 1000 is a very affordable stow away weight bench for way under $100. Although the durability can’t be compared to the GFID225, it can still support up to 800 lbs of weight in total. Furthermore, it only weighs 35 lbs, so can easily be transported from one place to another! 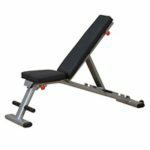 If you want a commercial rated weight bench then the Body Solid GFID225 is very heavy duty which supports around 1000 pounds including your own weight. You’ll also benefit with the lifetime warranty offered only if you’ll be using it at home. Although this is a bit more expensive, it’s actually quite unique in the sense that it’s commercial rated but can also fold away conveniently. 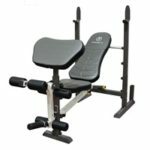 Users who prefer a folding Olympic weight bench can choose from either the BFOB10 or Marcy from our comparison table above. However, these two can’t really compete with the other top rated Olympic benches, as it’s not as well built and sturdy enough. The only edge they do have over its competitors is that it can conveniently fold up and be stowed away. There are pros and cons of each one, our guide on what type of what bench to buy, will give you a comparison between the two types. 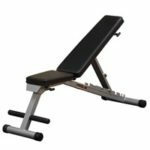 If you are restricted on space then a fold up weight bench should be highly considered, this is especially ideal if you live in an apartment. 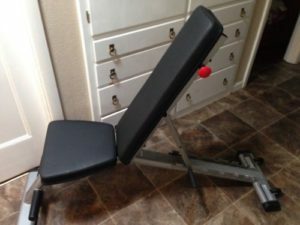 This will enable you to even workout in your bedroom and when you’re done, you can fold up the bench flat and put it to one side pretty much anywhere in the room. A folding Olympic weight bench doesn’t completely eliminate the lack of space issue as when it folds up it still takes up a bit of room. It’s more of a preference if you prefer working out using an Olympic bar. However, a good substitute for this would be to use a squat rack with a folding workout bench, this will enable you to workout with an Olympic bar. Once you’ve decided on the best compact weight bench it’s time to get some weights. If you’ve chosen a folding weight bench under bed, then a set of adjustable dumbbells will be more space friendly. However, it’s worth comparing adjustable dumbbells vs fixed, as there are pros and cons of each one.